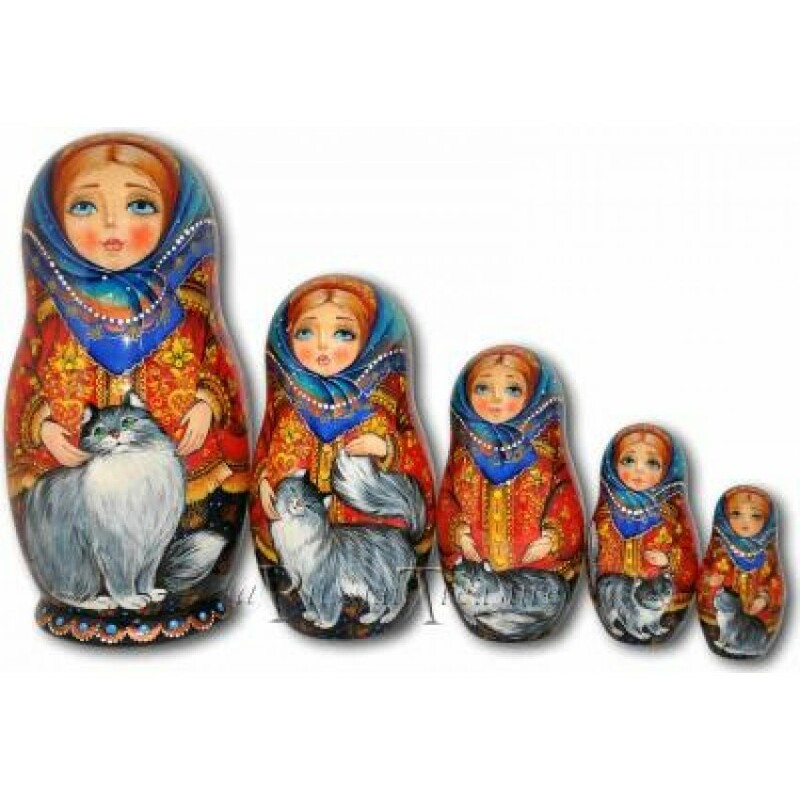 This exquisite set of Matryoshka nesting dolls was hand-crafted in Russia and personally selected from the artists that we have worked with for many years. Painted with a touch of a traditional folk style, these Matryoshka nesting dolls represent a fine example of Russian handicraft and artistry. Each Matryoshka nesting doll is dressed in the authentic red jacket with golden ornaments and a kokoshnik of the same kind, as red has the meaning of “beautiful” in Russian. The lordly cat embedded in the image of these Matryoshka nesting dolls looks as a little kitten with the youngest doll in the set, and then gradually grows into the silvery-gray puss with a crafty look of emerald-green eyes. The young girl, portrayed in these Matryoshka nesting dolls, has a face full of innocence and humility, as her large azure eyes look dreamily up into the sky, while the rosy lips remind one of a delicate flower. The back of Matryoshka’s sapphire kerchief is covered with a celadon veil with painted chamomiles, symbolizing purity through their white petals and the beauty of body and soul through the yellow heart. Gold leaf, used for Matryoshka’s kerchief adornment as well as to decorate the bottom of each nesting doll, sheds a sparkling light while adding even more attraction to the whole composition of this set of Matryoshka nesting dolls. If you are looking for a tender gift for someone really special, you don’t need to look any further – this set of Matryoshka nesting dolls is the best choice.